Al Armendariz, the EPA’s Prefect over the troublesome and barely subdued South and Southwest region of the US who was so fond of “crucifixion” and “making examples” out of oil and gas companies in order to more easily manage Region VI, has resigned. Of course, in his resignation letter, Armendariz claimed that his draconian philosophy of “crucifying” energy companies in order to strike fear of the EPA into industries did not reflect his work as administrator of the five-state region. 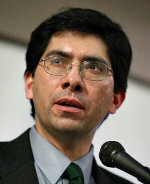 How many radicals appointed to power by Obama who’ve later been forced to resign or be terminated does Armendariz make? [SinglePic not found] Solving for urban crime should be approached kind of like how the Romans used to conquer little villages in the Mediterranean. They�d go into a little Turkish town somewhere; they�d find the first five guys they saw and they would crucify them. And then you know that town was really easy to manage for the next few years. And so you make examples out of people who are, in this case, not compliant with the law. Find people who are not compliant with the law, and you hit them as hard as you can and you make examples out of them, and there is a deterrent effect there. And, neighborhoods that are smart see that; they don�t want to play that game, and they decide at that point that it�s time to clean up. And, that won�t happen unless you have somebody out there making examples of people. So you go out, you look at an neighborhood, you find people violating the law, you go aggressively after them. That’s my philosophy for solving for urban crime. You go into the ghettos and you crucify a few of the thugs. You make examples out of them and the rest of the hood toes the line. And we do have some pretty effective enforcement tools. Compliance can get very high, very, very quickly. The kindest, gentlest, and most civil cry from the Liberals and their minority tenants would be, “You can’t do that!” Most responses to this philosophy for solving for the Urban Crime question would be far more vicious and vitriolic, with some quarters making various threats of violence and insurrection in response to such practices. Their response is, of course laughable – though history and current events have both shown Americans that the threats of violence from certain sorts must be taken seriously and dealt with accordingly – because their response is not based upon any sort of objective logic or moral standards. Simply replace any reference I made to Urban Crime with violations of the EPA’s convoluted regulations and replace any references to neighborhoods or people with oil and gas companies and you have the statement that the EPA’s Region VI Administrator, Al Armendariz about his way of conducting operations in Texas. Hear any Liberals or their minority tenants crying about tyranny, despotism, the police state, or anything over Al Armendariz’s way of running the EPA in his region? I sincerely doubt it. Size matters – both the size of the job and the size of the character, will, and abilities of the man tasked with undertaking it. If these two don’t match up, either the job goes undone or misdone or the man is wasted. The worst case scenario is a big job being performed by a small man. This always leads to failure, as the small man can neither do the job nor accept his own failings. This is exactly the crisis facing America today, as Rep. Boehner bravely pointed out this week. This is the biggest job in the world and I�ve never seen a president make it smaller. The president keeps attempting to invent these fake fights because he doesn�t have a record of success or a positive agenda for our country. America doesn’t have a big man in the Presidency. It doesn’t even have a small man in that office. America, in the person of Barack Obama, has a narcissistic and petulant little boy of few skills, little will, and far less character pretending to be both a man and the POTUS. 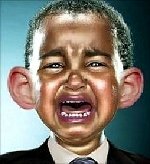 Everything Obama does proves that he’s just previously pampered yet unloved child lost in a man’s world who is seeking to shirk and shrink his responsibilities because they are too much for him. The non-stop campaigning; the constant blaming of others for any and all of his problems; the mendacity with which he speaks; the preference for ruling instead of governing; the claims of unfairness; and the petty tirades and snide responses when called on his failures are all behaviors of a bratty little boy seeking to make his job smaller. Yes, size matters and America needs a big man to fill the role of President, not a whining little boy of low character like Obama. That’s Going To Have A Disproportionate Impact Upon Blacks! The owner has to know that his prohibition on “sagging” will have a disproportionate impact upon Blacks and is, hence, racist despite the facially neutral nature of the stricture. Federal courts have long held that motive and purpose were and are irrelevant and that even de facto and de jure nomenclature are meaningless as a defense against charges of racism. Only the end result, unburdened by circumstance or context, matters. Since “sagging” is based upon prison behavior and Blacks are disproportionately prone to criminality, and because they have a culture based upon glorifying criminal behavior, they are the ones most likely to be wearing their pants belted well below their butts. Hence, Blacks – especially young Black males – will be the ones most likely negatively impacted by this cafe’s dresscode.